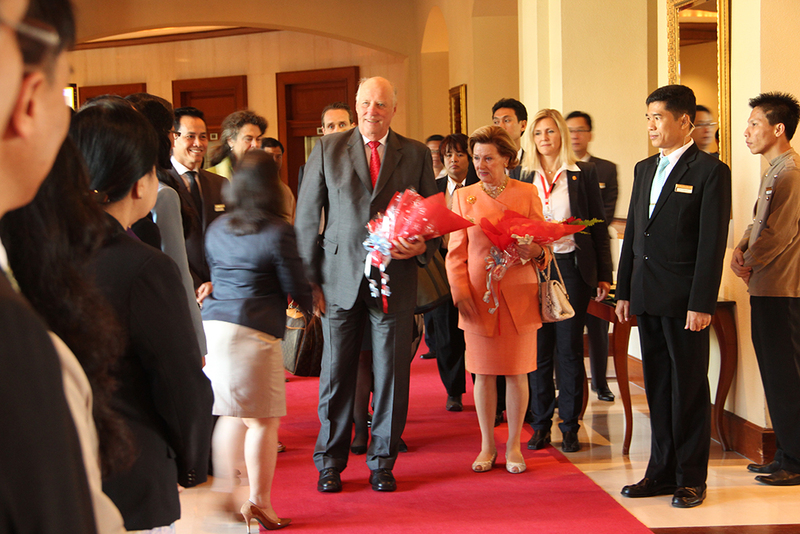 Their Majesties King Harald V and Queen Sonja of Norway stayed at Chatrium Hotel Royal Lake Yangon during their State Visit to Myanmar from 1 to 3 December, 2014. They were officially welcomed to Myanmar by President U Thein Sein and Wife Daw Khin Khin Win in Nay Pyi Taw. On Tuesday December 2nd, H.M. King Harald V of Norway held a speech at the University of Yangon on democratic development. Chatrium Hotel Royal Lake Yangon proudly provided catering service for this event. During their stay, they attended Norway Inspiration Night Gala Dinner Reception hosted by The Royal Norwegian Embassy in Yangon and Innovation Norway on 2nd December at Ngapali Pool Garden, Chatrium Hotel Royal Lake Yangon. Myanmar Government Officials, H.E U Soe Thein (Minister of President’s Office), H.E U Aung Min (Minister of President’s Office), H.E U Win Tun (Union Minister, Ministry of Environmental Conservation and Forestry), H.E U Than Htay (Union Minister, Ministry of Energy), H.E Dr. Daw Khin San Yee (Union Minister, Ministry of Education), H.E U Myat Hein (Union Minister, Ministry of Communications and Information Technology), H.E Dr. U Ko Ko Oo (Union Minister, Ministry of Science and Technology), Daw Aung San Su Kyi (Chairperson of the National League for Democracy – NLD), Diplomats, Guests of Honor, Ms Ann Ollestad (Norwegian Ambassador to Myanmar) and family members from Norway Embassy attended the reception.